Today is the day. It’s time to vote in the New York primaries. I’ve turmoiled for months over my voting decision. Do I follow my values and beliefs, which align with Bernie’s socialist and egalitarian dreams — or do I vote for Hillary, the candidate who is most qualified, a realist, and full of leadership chutzpah. And how do I know that my subconscious isn’t influencing me to vote for the Woman or the Brooklyn Jew, both of whom I identify with? When I envision myself in the voting booth, pulling that lever, or pushing that button, or whatever it is these days, I feel pride and guilt no matter which candidate I imagine voting for. Being politically passionate without being politically aware is a common plight in today’s pop-culture politics society. I’ve done my due diligence in the form of three online “who should I vote for” quizzes by (theoretically) non-partisan organizations. I’ve watched my Maddow clips along with my SNL and John Oliver commentary. I’ve stayed awake through a couple of debates and watched the brief recap videos of the rest. I’ll be the first to admit that there are a lot of complex issues that I don’t feel I have enough information to have a strong opinion on. On these issues, I feel that Hillary just knows more. She is prepared, she is poised, she has knowledge and resources and knows how to use them. I trust her to know what’s going on and look at all the sides of an issue, even if she doesn’t pick the most overtly liberal option. On the other hand, while I struggle to associate Bernie’s loveable, feisty grandpa persona as being “presidential,” his record of pure goodness, his intelligence and liberalism, his understanding that when “the people” are empowered, the country will grow and succeed, make for a fantastic candidate. 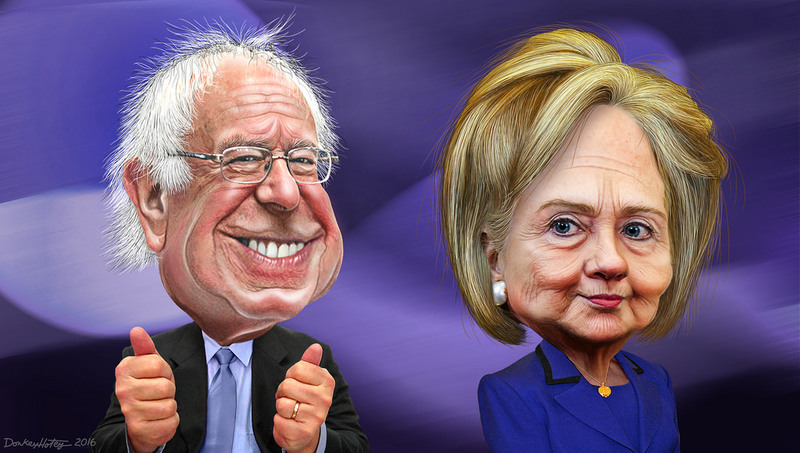 In polls, both Hillary and Bernie can beat any republican candidate. While it’s unlikely that Bernie will beat Hillary for the nomination, it’s still a distinct possibility, and I feel good knowing that either of these candidates will be President. Whichever democratic candidate winds up running, against whichever imbecile becomes the Republican nominee, they will receive my full, vocal, active, and passionate support. Today, though, who to vote for? If I vote for Bernie am I caving to millennial pressure? If I vote for Hillary, am I just being contrarian? The Woman or the Jew? The dreamer or the realist? The loyal leftist or the more flexible liberal. Today, I am going to listen to the pleas of my family and friends. I’m going to vote for Bernie. I’m going to vote for the dream. At this point in the election, a vote for Bernie is a vote for his ideas. I’m going to be true to my dreams. But when the actual election day FINALLY comes, if and when the candidate is Hillary, she’ll still get my full and enthusiastic support.